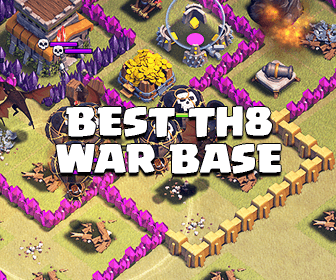 Hey guys it’s Ash and one of the things I’m lacking on my channel are war attack guides for TH8s (and I’ve been really meaning to get a lot new war content for TH8s), so today I’ll be sharing a Hog Rider guide because in my opinion, a mass Hog Rider attack is among of the best 3 star attack strategies for a TH8 and a well planned attack will allow you to 3 star any opposing TH8 base. So I’m going to try my best to make this a very easy to understand and a very easy to learn strategy. First I’m going to teach you guys the fundamentals of the attack strategy, and at the end I’ll show you guys some great examples of 3 star attacks using this strategy. 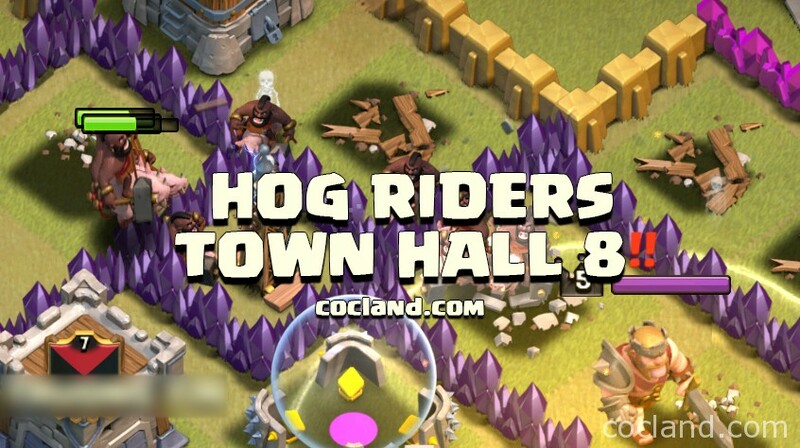 At TH8, you’re able to upgrade your Hog Riders to level 4, which is significantly better than a level 3 Hog Rider and will make it much easier to 3 star TH8s. So if your Hog Rider isn’t level 4 yet and you want to be able to consistently 3 star opposing TH8s with this strategy, then I definitely recommend upgrading to level 4 as soon as possible. Level 3 Hog Riders will work against some bases as well, especially if you properly use this strategy. I would still recommend level 4 Hog Riders for the best chance at 3 starring. Now I will outline the main threats that you need to worry about when conducting this strategy. If you’re able to remove these threats out the way, then the chances of 3 starring becomes incredibly easy. There are 2 main threats to this attack, which are the Clan Castle threat and the Giant Bombs, especially Double Giant Bombs, which are 2 Giant Bombs placed together to eradicate all your Hog Riders at once. So to counter the Clan Castle threat, you must bring Poison Spells. I recommend you cook 1 Poison Spell and also get another one from your donations. With two level 2 Poison Spells, you’re able to kill any threat inside an opposing TH8’s Clan Castle. The most commonly used troop in a TH8 Clan Castle is the Dragon, so with 2 level 2 Poison Spells, you can easily kill the Dragon after luring it. Or, you can use the more traditional method of pulling the Dragon out to the side and use a couple of Archers to kill it. 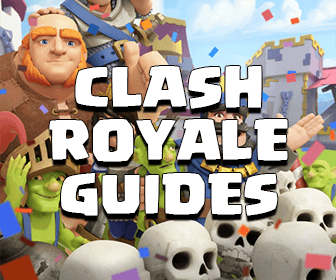 The Clan Castle is a major threat, and it’s a MUST that you remove whatever the threat that’s inside before deploying all your Hog Riders. What If I can’t lure the Clan troops? Now what do I do if the Clan Castle is at the center and I’m unable to lure it. Well in this case, you need a Kill Squad. A kill squad consists of using the Barbarian King with Wizards and Wall Breakers and sometimes a Golem. The goal of the kill squad is to trigger the Clan Castle and also disrupt or trigger possible Giant Bombs. You can also use the kill squad to remove the opposing Barbarian King because he is also a threat to Hog Riders, but I wouldn’t worry too much about the Barbarian King as long as you have a large group of Hog Riders, you’ll be fine. I’ll get more into detail of how to properly use the kill squad later. The other major threat are the Giant Bombs. Giant Bombs deal double the damage on Hog Riders and two of together are able to one shot your Hog Riders. So they are a major threat that you must be aware of. The great thing is, a single Giant Bomb will not kill your Hog Riders in one shot, so what you can do to counter it is simply place a Heal Spell to keep your Hog Riders healthy. A smart thing to do is to place your Heal Spell before a likely Giant Bomb targets your Hog Riders. In order to do this, you must be able to predict where the Giant Bombs are, and that’s not hard to do either and later I’ll show you how to predict where the Giant Bombs are in a base. Also, a TH8 only has a total of 3 Giant Bombs, so they’re only able to hide one group of Double Giant Bombs, so if you can trigger or disrupt the placement of the Double Giant Bombs, then you can easily 3 star the base and I’ll show you how to do that as well soon. Also, you can take a look at this guide If you want to design your own base with perfect Giant Bomb placement. The next thing I want to talk about is the pathing of the Hog Riders. 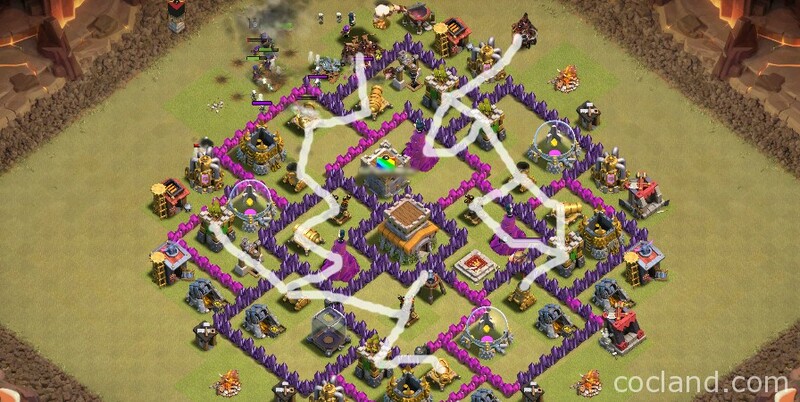 It’s very important that you know how Hog Riders will travel so you can easily plan out your attack. Hog Riders are in my opinion one of the easiest troops in the game to understand their pathing just because they’re able to jump over the walls and go straight for the defenses. Assuming that you drop your Hogs from those 2 spots and they will attack the Cannon and the Archer Tower at 2 big dot spots. After that, they won’t move to the Wizard Tower behind because those 2 Mortars are closer; after taking 2 Mortars down, Hog Riders will move to the next Air Defense and then the Air Sweeper. Now let’s talk about how you can predict and stop Giant Bombs from killing your Hog Riders. Once you understand the pathing of Hog Riders, you can quite easily predict all the possible placements of the Giant Bombs. Remember, Giant Bombs occupy a 2×2 tile space, so you should be aware of all possible empty 2×2 spaces in the base. Now, for a Giant Bomb to effectively harm your Hog Riders, it must be placed in between two defenses. So if there’s an empty 2×2 space but it’s nowhere within the path of the Hog Riders, then you can ignore it. Now what about Double Giant Bombs, how do I predict where they are? Well that’s pretty easy as well because a possible Double Giant Bomb placement occupies 2×4 tiles. As you can easily see in the example below, there is a possible Double Giant Bomb spot (next to the bottom Air Defense). How to use the Healing Spell? Healing Spell is an extremely important part in any Hog Rider attack. I have seen lots of failed Hog Rider attacks, and most of the time, It’s because the attacker don’t know how to drop the Healing Spell properly. That’s why I wrote a detailed guide about this special topic. You can read more about it at How to heal your Hogs properly. The last thing I want to talk about is the Kill Squad. The main objective of the kill squad is to disrupt the placement of or trigger or even test for the possible placement of Giant Bombs within a base. As well as possibly remove the opposing Barbarian King and sometimes even lure the Clan Castle if it’s deeply centralized inside the base. Kill squads aren’t always necessarily against some bases, but properly using it will make your life easier and pretty much guarantee a 3 star win on some occasions. So now I’m going to show you guys some examples of 3 star Hog Rider attacks by Rustie’s Tribe in the video below. It’s an awesome clan full of very friendly and helpful people. Now I also want to state that some of these attacks were conducted by beginners to this strategy, so even though some of their attacks were not perfect, you can see just how powerful the strategy is and how easy it is to learn. So i hope you guys learned a lot and enjoyed this guide and also the video above. If you did, please support me by sharing this guide and also the video with your friends. And I’m going to try to have more of these great strategy guides for TH8s. So thanks for reading and I’ll see you guys again soon. You rock!